The author of The Art of Seduction draws on some of history's most effective military tactics and the examples of such figures as Napoleon, Margaret Thatcher, and Ulysses S. Grant to outline psychological strategies for effective negotiating, responding to dangerous situations, and managing life milestones. Reprint. Robert Greeneâs groundbreaking guides,Â The 48 Laws of Power,Â The Art of Seduction, andÂ Mastery, espouse profound, timeless lessons from the events of history to help readers vanquish an enemy, ensnare an unsuspecting victim, or become the greatest in your field. 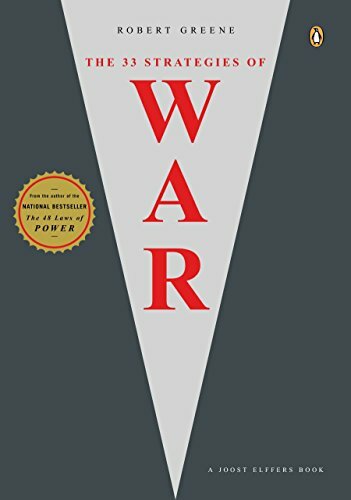 InÂ The 33 Strategies of War, Greene has crafted an important addition to this ruthless and unique series. Spanning world civilizations, synthesizing dozens of political, philosophical, and religious texts and thousands of years of violent conflict,Â The 33 Strategies of WarÂ is the I-Ching of conflict, the contemporary companion to Sun TzuâsÂ The Art of War. Abundantly illustrated with examples from history, including the folly and genius of everyone from Napoleon to Margaret Thatcher, Shaka the Zulu to Lord Nelson, Hannibal to Ulysses S. Grant, as well as movie moguls, Samurai swordsmen, and diplomats, each of the thirty-three chapters outlines a strategy that will help you win lifeâs wars. Learn the offensive strategies that require you to maintain the initiative and negotiate from a position of strength, or the defensive strategies designed to help you respond to dangerous situations and avoid unwinnable wars. The great warriors of battlefields and drawing rooms alike demonstrate prudence, agility, balance, and calm, and a keen understanding that the rational, resourceful, and intuitive always defeat the panicked, the uncreative, and the stupid. An indispensable book,Â The 33 Strategies of WarÂ provides all the psychological ammunition you need to overcome patterns of failure and forever gain the upper hand. About: The author of The Art of Seduction draws on some of history's most effective military tactics and the examples of such figures as Napoleon, Margaret Thatcher, and Ulysses S.
About: Brilliant distillations of the strategies of warâand the subtle social game of everyday lifeâby the bestselling author of The 48 Laws of PowerRobert Greeneâs groundbreaking guides, The 48 Laws of Power, The Art of Seduction, and Â Mastery, espouse profound, timeless lessons from the events of history to help readers vanquish an enemy, ensnare an unsuspecting victim, or become the greatest in your field.